Nevada’s legal gambling age is 21 and identification is required. How do I request a donation from Circus Circus? The social investments made by MGM Resorts International™ are dedicated to strengthening the communities where our employees live, work and care for their families. For this reason our charitable contributions are focused in Nevada, Mississippi, and Detroit, Michigan. Our giving areas focus on development of at-risk youth, public education, community development, and diversity. If your request falls within these geographic and giving priorities, please visit our website at http://www.mgmresortsfoundation.org for more information. May I rent a wheelchair or a baby stroller? Yes, however wheelchair availability is limited and is on a first come-first serve basis. Please contact the Bell Desk for information. If it is vital that you have a wheelchair, we suggest you bring your own. Baby strollers are available in the Adventuredome Theme Park for a small fee. Is a credit card required upon check in? Credit or Debit card is required upon check in. If you are paying with a credit card, you must present the credit card at check-in. If you are not the credit card holder, please contact Room Reservations for details of our credit card policy. Valid picture identification required. The name on the credit or debit card must match the name on the reservation as well as the picture identification. Do you provide transportation to and from the airport? No, however shuttles, taxicabs and limousines are available at both the airport and at the hotel. What can you tell me about the Circus Circus swimming pools? We have three swimming pools: two at the Skyrise tower and one in the RV Park. All swimming pools are outside and also have Jacuzzis. The pools are heated to 80 degrees and their depths are from 3 feet to 6 feet. All pools will have seasonal closures and closures due to inclement weather. What is The Las Vegas Strip and Clark County curfew law for guests under the age of 18? How can I access the internet while visiting your hotel? Internet access is available at various internet kiosks located throughout our property. Wireless internet access is also available in all hotel rooms. How do I apply for a job with Circus Circus? You can apply online at mgmresortscareers.com. What amenities are included in each room? Alarm clocks, wireless internet access, cable TV, hairdryer, iron and ironing board, and safes. You can request a crib for an additional $20 per night (limited availability). You can request a mini-fridge for an additional $20 per night (limited availability). Cots are only available in rooms with 1 king size bed, when requested for an additional $20 per night (limited availability). We do not have laundry facilities, but guests may contact the Bell desk for dry cleaning and laundry services. Do you have child care? We do not provide child care. Is there a property map I can download? Yes, you can download our property map on the ‘Contact Us’ page. 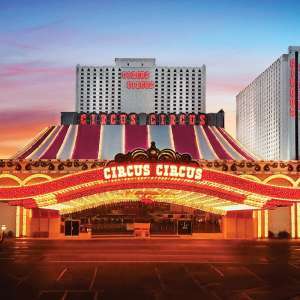 A Daily Resort Fee plus applicable tax is applied to each hotel reservation and includes amenities that are sure to enhance your experience at Circus Circus. The Resort Fee includes: In-Room internet access, unlimited local and toll free calls, airline boarding pass printing, and fitness center access for guests 18+. Yes - limited number with roll-in showers. What happens if I checkout earlier than my confirmed departure date? An early departure fee of 1 night will be charged. How do I send or receive a fax at your hotel? The fax number is 702.734.2268. To receive there will be a charge of $5 for the first 2 pages and $1 for each additional page. To send inside the U.S. there will a charge of $5 for the first 2 pages and $1 for each additional page. To send a fax overseas there will be a charge of $10 per page for the first 2 pages and $2 for each additional page. Do you have a phone line for the hearing impaired? Yes. The phone number is 800.638.8595. How old do you have to be to check in to the hotel? Because Circus Circus is a gaming establishment you must be at least 21 years old to check in to a room. Do you have TDD/TTY devices available? Can I book a reservation over the phone? Yes, but you can save $10/night by booking online. Do you allow pets in the hotel? No, except for service animals for people with disabilities. At the RV Park, pets are allowed. Please be advised, during the summer months the temperatures are very high and heat build-up in cars will kill animals. In order to receive a full refund, we require 72 hours notice prior to your scheduled arrival date. How close is Circus Circus to the Las Vegas Convention Center? We are located one mile from the Las Vegas Convention Center. For complete details on parking, please visit the Circus Circus parking information page. Is late check out available? Late check out after 11 AM is available for a fee. Please call 702.734.0410 for availability and rates. Is smoking marijuana permitted at your property? Use of marijuana (weed), including but not limited to smoking, inhaling, ingesting, or using oils, lotions, or other transdermal introduction of, is prohibited at all MGM Resorts properties notwithstanding approval of recreational use in Nevada. State law prohibits use of marijuana in public places. Use of marijuana is also prohibited in guest rooms at all MGM Resorts properties in Nevada, consistent with the discretion afforded private property owners under the State law authorizing use of recreational marijuana in non-public places. And marijuana use continues to be prohibited at MGM Resorts properties outside Nevada. Notably, the vast majority of our guest rooms are non-smoking and therefore smoking of any substance in those rooms is prohibited. If marijuana in any form is observed, the property will take the necessary steps to ensure compliance with the law and Company policy. Do you allow smoking in the resort? Please note that e-cigs, vapors, hookahs, marijuana etc. fall under our non-smoking policy. Cleaning fees will be applied to smoking in areas that are non-smoking. We do have designated smoking areas throughout the casino, bars, and other areas. Contact a resort employee for location information regarding designated smoking areas. We do not have smoking rooms. If smoking occurs in a non-smoking room during your stay, a $300 cleaning fee will be charged. Additional replacement charges may apply. What is the temperature going to be like during my stay? Please note all temperatures given in Fahrenheit. Winter: December, January and February average daily temperature is 45 degrees. Spring: March, April, and May average daily temperature is 70 degrees. Summer: June, July and August average daily temperature is 100 degrees. Fall: September, October and November - average daily temperature 80 degrees. Where can I order a cake? You can order a cake through Concierge. Concierge can be contacted at 702-794-3777 or 800-634-6717. How can I obtain a copy of my bill from a past stay? To receive a copy of your bill, please visit mgmresorts.com/folio. Book direct on circuscircus.com. Telephone rates are higher.